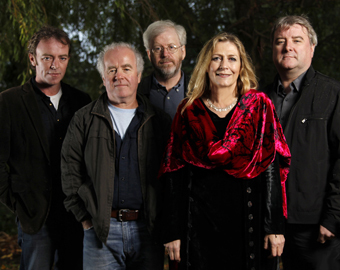 The Irish super-group Altan is coming back to the Freight! PopMatters calls them “Ireland’s leading interpreters of its musical tradition.” “Altan’s special strength,” says the New York Times, “is the clarity and coordination of its textures.” The Los Angeles Times declares, “Altan continues to be one of the Celtic world’s great treasures, gifted with a front line that is a sheer powerhouse,” and the Irish Echo adds, “Under no circumstances should they be missed in concert.” They have a knockout new album, The Widening Gyre, which brings Ireland to Nashville, as well as the other way around, featuring musical guests like Mary Chapin Carpenter, Alison Brown, Tim O’Brien, Sam Bush, Jerry Douglas, Todd Phillips, Bryan Sutton, and Darol Anger. Altan has its origins in Ireland’s County Donegal, where two teachers, Mairéad Ní Mhaonaigh and Frankie Kennedy, began performing as a duo in 1981. A band gradually came together around them, playing in little clubs in Dublin and Belfast and at great festivals. Frankie was diagnosed with cancer in the early 1990s, but continued to play with the band through his treatment, until shortly before his death in 1994. His influence continues to inspire the band, which has gone on to even greater success with gold and platinum albums in Ireland and popular tours around the world. With Mairéad on fiddle and vocals, Ciarán Curran on bouzouki, Ciarán Tourish on fiddle, Dermot Byrne on accordion, and Mark Kelly and Dáithí Sproule on guitar, the band brings alive the beauty and joy of Irish traditional music. The name Altan comes from a deep and mysterious lake behind Errigal Mountain in Donegal. It’s a perfect fit for a band that makes music of great depth and beauty.